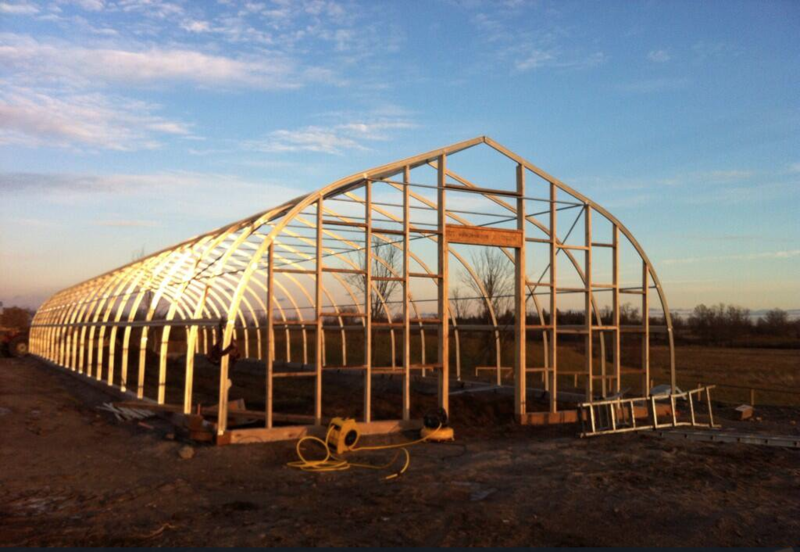 We built a 100 x 24 foot passive solar greenhouse in 2013 thanks to a grant from the Carrot Cache. It allows us to grow year-round, with a minimal amount of energy expenditure. It is an unheated structure – there is a double walled layer of plastic on the roof which is inflated by a small fan. This layer of plastic insulates the structure, and combined with layers of Agribon, allows us to keep our crops warm enough to keep going year round! We produce greenhouse tomatoes all summer long, and seed winter crops in September. The greenhouse is also a lovely place to spend some time in in February, when it’s -40 degrees on the farm. On a sunny day the temperature in there can get up to +20!